â€œIllegal immigrants do pay taxes,â€ she declares. Vanessa Salazar is slouched in her seat, resting her head against the palm of her hand. It is she who had spoken. Vanessa had remained quiet for the rest of the conversation. She did not speak until one student stated that he believed illegal immigrants should be deported because they do not pay taxes. Like many of my classmates, Vanessa was originally from Mexico. She spoke Spanish and had an extensive knowledge of her Mexican heritage. She was absent from school for a few months because she had a child in her junior year. That is how I knew her. Vanessa would occasionally talk about her daughter and how she would need to buy baby supplies after school. Vanessa exhibited an air of indifference that was common in our circles. When Vanessa spoke in that debate class, it was the first time I saw her become passionate about something. Vanessaâ€™s outburst had me rethink that maybe she was academically motivated and willing to participate in class. It seemed to me that Vanessa had complicated her life by becoming pregnant. Despite having a child, Vanessa attended school regularly. She never complained about her child. She took on the responsibility. The Mexican students in my high school were not my only interaction with immigrants. My best friend from high school, Raeda Rahman, was a Pakistani immigrant. Her nationality would come up on occasion, but as friends we did not dwell on it. I had this belief that immigrants, especially immigrant children, would eventually forget about their home country as time went on. 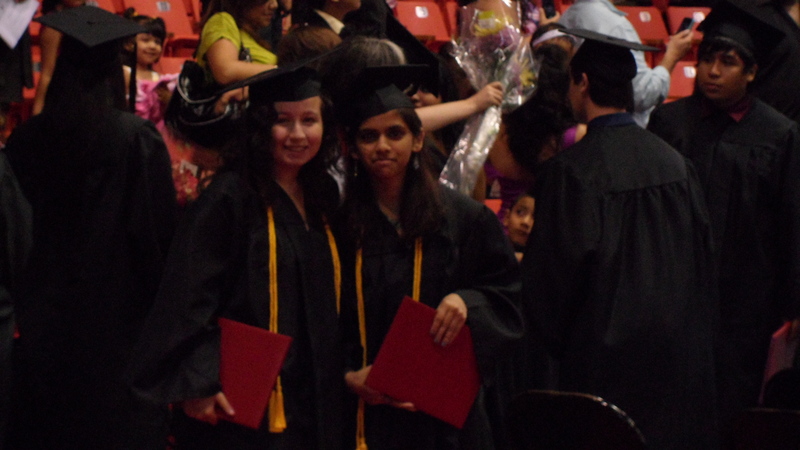 Raeda and me at our graduation. family went to Pakistan. When she returned, Raeda called me and told me she was married in Pakistan. I knew that if I were introduced to a man and expected to marry him in weeks, I would have been horrified. However, Raeda was content with what happened and proceeded to happily tell me how sweet she thought her new husband was. Vanessa and Raeda were immigrants who were my age. In college I had the opportunity to talk to immigrants who were older than me. While most of the immigrants in my high school came to the United States to find more work opportunities, many of the immigrants Iâ€™ve interviewed since came to the United States for different reasons. Some were Bosnian immigrants. I talked to them for a project I was working on for a class. When I began the interviews, I assumed that they were happy in United States. It turned out I was right mostly. One immigrant, Nihad Krndzija, an ex-soldier had lost his leg in Bosnia. After moving to the United States to seek medical attention, Nihad and his wife decided to stay and start a family. Nihad was interested in technology. When I visited him at his house, he showed off his collection of computers and recording equipment. He also took an interest in the video equipment I was using. When Nihad talked about the time he lost his leg, he was straightforward, and when he finished the account, he started smiling again. Vanessa, Raeda and Nihad all had different experiences as immigrants, all far different from my experiences. Despite their struggles with different cultures and personal obstacles, all three managed to exude a sense of peace. They were optimistic yet realistic about their lives in the United States and somehow more prepared than I sense I am to take on whatever comes next.